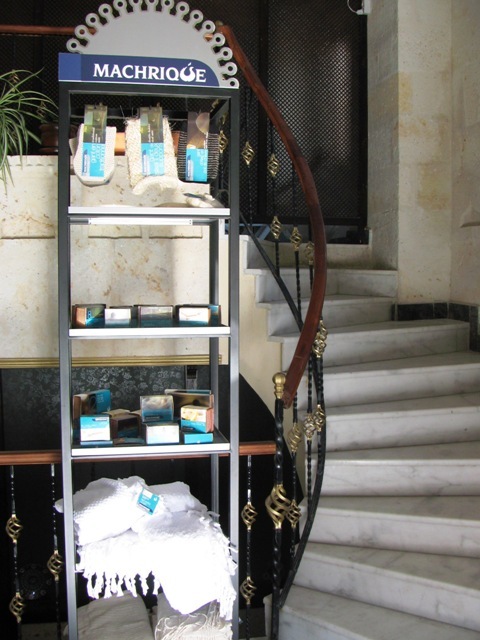 For the full Turkish experience, you need to have a Turkish bath, but first read these two excerpts from my book to learn how to choose the right Turkish bath for you! Wanting to complete our day with a Turkish bath, we asked our friend if he knew of any budget baths since the fancy tourist ones in the old town were out for our budget. He suggested one in a different part of town where the local Turkish women go. A bath only cost $8 and for an extra $8 you can get a full body massage. The price was right so we went for it. A short cab ride brought us to a rather nice entrance where we were about to enter the bathhouse until a man stopped us and pointed to the woman’s entrance around the back. The woman’s entrance was not as nice but we went in anyway. None of the women spoke English so after a round of charades we ended up in a change room wondering what to change into. I grabbed some bath cloths then the two of us walk out wrapped in the cloths still wearing underwear. The receptionist pointed to a door where a large woman in huge white granny underwear motioned for us to lie down on the marble slab while she poured buckets of hot water onto the floor creating steam. We laid there for 15 minutes until a large haggard looking woman spilling out of a tight leopard skin thong appeared out of nowhere. I trembled like a death row inmate when I realized that this was our “bathacutioner” and I was first up. She threw on an abrasive oven mitt, wringed some suds onto my back then proceeded to rub the skin clean off my body in a manner reminiscent of the torturous bath scene from Mommy Dearest. I clenched my teeth and bared the pain breathing a sigh of relief when she finally put on a softer glove and gave me a soapy massage before shampooing my hair and rinsing me off with buckets of warm water. When it was Carolyn’s turn she looked at me and asked “Is this going to...aghhhh! For some unknown reason I got a certain guilty pleasure from watching my friend endure the same pain. It is true that misery loves company because I loved every minute of it. Sixteen dollars worth of misery later, Carolyn and I were recovering on the marble slab contemplating if getting a massage was really a good idea. Obviously we were both suckers for punishment because despite everything we continued on. A lady came in and led us back to the reception area where I laid on the massage table shivering for a good 15-20 minutes waiting for the bathacutioner to change from her thong her into her massagochist outfit. Mere moments before frostbite set in, she sat down beside me, squirted cold baby oil onto my back and rubbed it into my skin. Much to my relief I started to warm up and regain feeling in my body. I was even feeling good about my decision to risk the massage that is until she had me flip over onto my front. At that exact moment, her co-worker returned from the store with a pack of cigarettes and handed herone. What the..? This woman has got to be the only masseuse on earth who thinks smoking on the job is acceptable. Just as she was about to light up, I gave her my best please don’t smoke charade. She put down the cancer stick and chatted with her co-worker instead giving little attention to the massage she was barely giving me. When her favourite soap opera came onto the television set, her attention shifted from her friend to the scandalous affair between a young Turkish woman with bad hair and what appeared to be her much older Turkish lover...possibly a carpet salesman. Thinking this massage couldn’t possibly get worse, I almost went into shock when a saleswoman entered the bathhouse and proceeded to sell my massagochist a pair of socks. Yes, you read that correctly – she purchased a pair of SOCKS in the middle of my $8 massage – and they weren’t even for me! Here’s a travel tip for anyone visiting Turkey: don’t be a cheapskate, pay the money and visit a proper Turkish bathhouse! Relieved when the massage finally came to an end, I looked forward to working through this traumatic experience with my therapist when I returned to Canada. I changed into some dry clothes and sat on a bench trying to keep my shoes dry while the cleaning lady threw pales of water on the floor in front of me in an effort clean the floor. Meanwhile Carolyn’s massage included what she described as a wrap around with the promise of a happy ending. She felt violated and wondered if the massagochist should be paying her. In the end, it turned out this bathhouse was not a bargain at all. I would have preferred to pay the price and have a beautiful bath story to share with all of you but apparently I need to learn these things the hard way. When I told Steven about my harrowing budget bath experience in Istanbul, he insisted I visit the Turkish bath in Goreme in an effort to help me work through my fear of Turkish baths before I left his country. It was my last day in Goreme and to make sure it was a good one, he booked me into a Turkish bath in the morning then a horseback tour in the afternoon. I reluctantly walked to the Elis Kapadokya Hamam (Hamam means bath in Turkish) and was delighted to discover it was nothing like the seedy bathhouse from Istanbul, this one was beautiful. The Elis Kapadokya Hamam brings the age old tradition of the Turkish bath to Goreme. When the Muslims first came to Turkey, they brought with them their own unique bathing customs, which combined with those of the Romans and Byzantines, evolved into the Turkish bath. The sultans constructed famous historical baths of marble with ornamental architecture in the larger centers to abide by the Qu’ran which emphasizes cleanliness as an essential part of Islam. An entire social atmosphere revolved around the practice of bathing and the Hamams became an important institution around which every milestone in a person’s life was centered. 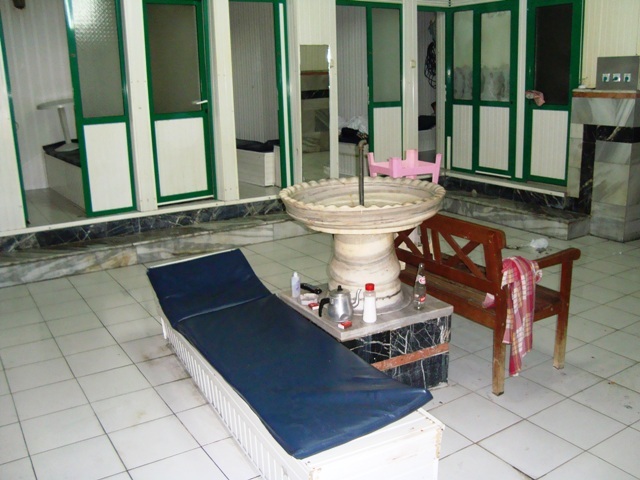 Brides and grooms visited the bathhouses on their wedding day for bath and massage and upon turning 40 days old their baby was brought to the hamam and given her first ritual bath. Older ladies visited the pubic bath to scout out potential wives for their sons while businessmen discussed business and politics. I walked up to the reception desk where I was greeted by a handsome young English speaking man who explained the entire procedure to me before directing me to the change room to put on the slippers and bath cloth he had given me. I was then escorted into a room where a lady applied a rich dark brown mud mask to my face then led me to a sauna where I relaxed and sweated for the next 20 minutes. Next I took a shower and cleaned off the mud before lying down on the marble slab and waiting for the bath attendant. This was a co-ed bath house and much to my surprise a woman and a man came over to ask me which one of them I would like to bath me. It was a tough decision because the guy was pretty hot and looked like he could give a good bath. 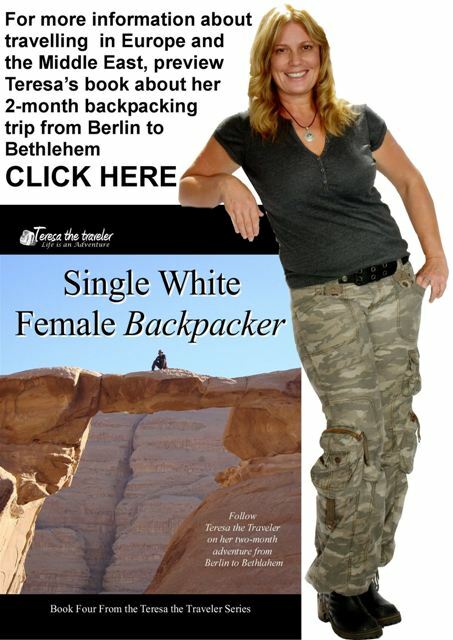 Unfortunately my modesty won out over my sense of adventure and I chose the woman. She poured soap into a large mitt then blew air into it creating a myriad of bubbles which she squeezed over my back making it tingle. She then put on a slightly abrasive mitt and began to scrub my body clean. Rather than rub the skin off my body like the Turkish torturer of Istanbul, she made my skin feel wonderful. After the scrub down she gave me a rub down. She massaged soft soap over my entire body in a way that made me feel relaxed, not violated. This was turning into the best bath ever. Once I was in a state of total relaxation and purring like a kitten, she poured warm water over me to rinse me off then instructed me to lie on the slab as long as I wanted before swimming in the pool. I took a 5 minute post-bath nap reliving the amazing experience once more in my mind before taking a quick dip in the pool. When I felt done I got out and went into another room where a handsome towel boy dried me off, wrapped me up in warm fluffy towels then led me to a chaise lounge where I relaxed and socialized over a cup of warm apple tea until I was ready to put my street clothes back on. 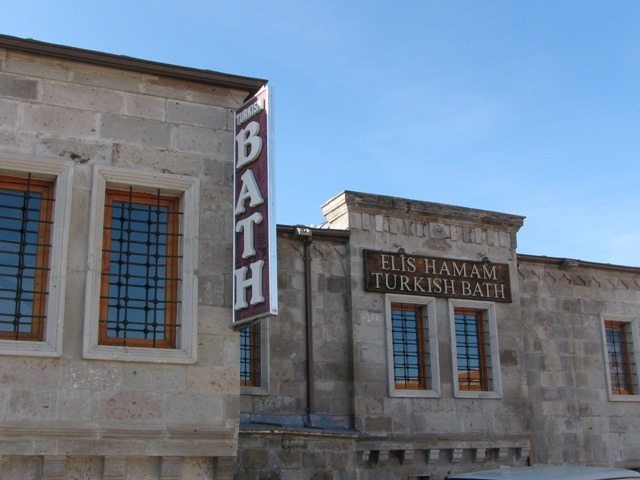 The whole experience was glorious and helped me overcome my fear of Turkish baths. In fact I now love Turkish baths.